One of my favourite birds is the African Jacana (Actophilornis africanus). It belongs to the family Jacanidae and has an average length of 23-31cm, with males weighing about 137 g and females 261 g. The most conspicuous characteristic is the huge, grey feet and claws which enables it to walk on floating vegetation such as lily pads. It is also very good at swimming and diving. The African Jacana has a chestnut body, and its neck and head are white in front and black at the back, with a golden yellow breast. The eyes are dark brown. It has a bright blue frontal shield, which is a bare fleshy area that extends from the bill to the top of the head. The sexes look alike, but the female is a bit larger than the male. They molt all their flight feathers simultaneously and are flightless during this period. The African Jacana does not migrate but can be very nomadic in response to water levels. These interesting birds feed mainly on insects and worms, and also other arthropods, including spiders, crustaceans, and molluscs. Seeds are sometimes taken. It searches for prey by walking on the floating vegetation, spreading the weight of its body over a larger area through its very long toes. When foraging it gleans prey from the surface, and also turns over the lily pads with the bill or even with the toes by grasping the edges. It is also able to catch flying insects. To avoid predators, it can swim underwater but the chicks can stay underwater for only a moment with the bill tip above the surface. If threatened, the bird raises its wings in an aggressive posture to the predator. It also utters raucous calls if an intruder flies across the territory. Outside the breeding season, this species is gregarious and may form very large flocks. 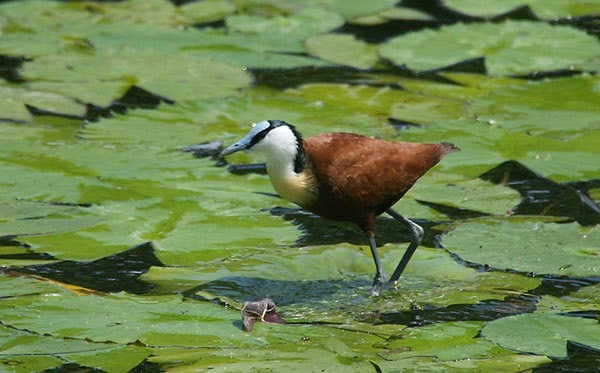 Like most birds, the African Jacana has a keen sense of sight and hearing and relies little on its sense of smell. Breeding takes place in wetlands throughout sub-Saharan Africa, generally avoiding forested regions and arid areas. African Jacanas have a polyandrous mating system, in which females can have multiple male partners. After mating and egg-laying, the female leaves the nest site and may look for another mate while the male incubates and raises the young. In permanent wetlands breeding may occur all year round or seasonally according to the water levels. The male builds the nest, often on small floating islands over deep water, and may move it if flooding threatens. The female lays four eggs, but not necessarily on the nest, sometimes depositing them on floating vegetation. The eggs are pale brown with black markings which make them almost invisible. The male starts to incubate after the third egg, and continues for 20-26 days. During the warmest hours of the day, he spends more time shading the eggs than keeping them warm. He may also move the eggs to a new nest site by carrying them under his wings. The male does not feed the chicks, but accompanies them while they feed themselves. The young remain with the male for a period of 40 to 70 days. They reach the full adult plumage when about one year old. The African Jacana is common to abundant throughout most of its range but may be locally threatened by wetland degradation and loss of habitat through flooding (as a result of hydroelectric projects, for example), drainage and overgrazing. Eggs and chicks are preyed upon by aquatic snakes, otters, marsh mongooses and birds that prey on both eggs and chicks. Though water lilies are the African Jacana’s favorite plant, they are able to forage and nest on other floating plants such as the exotic water fern of genus Salvinia. The IITA campus has eight small lakes and a large reservoir that harbor a high population of African jacanas. Sighting this beautiful, social and sensitive bird, also known as “Jesus bird” because it appears to walk on water, is an amazing and captivating experience. You will smile when you watch its fascinating behaviour. The IITA campus is a wonderful home for birds and an important one, being designated as an Important Bird Area (IBA) by Birdlife International.